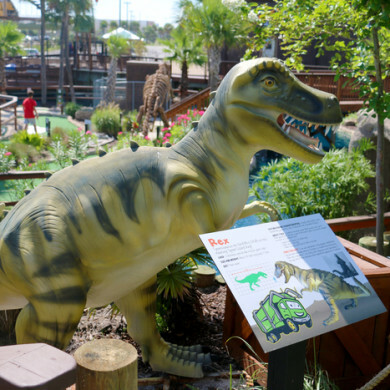 If you have a kid who’s obsessed with dinosaurs – and we’re pretty sure we all go through that phase at least once in a young life – you need to make plans to spend a day at Wild Willy’s Adventure Zone in Fort Walton Beach. This place is a child’s paradise, placing you and your family in the middle of all the action on a prehistoric adventure. The largest family entertainment center in Northwest Florida, its 17,000 square feet of air-conditioned indoor space will keep you cool on our hot summer days or dry on rainy ones – housing a state-of-the-art gaming arcade, 4D movie theatre, laser maze, pizza and ice cream parlor. Wild Willy’s Adventure Zone opened in May 2015. Prior to opening, visitors and residents of Okaloosa Island either had to cross the Brooks Bridge into Fort Walton or the Marler Bridge into Destin for entertainment. This is the perfect spot to entertain the kids for a day – especially if anyone in your brood has a birthday coming up! Sudduth tells us everything is made from scratch in the on-site Salvati’s Pizza Factory and Yogo Mogo’s frozen yogurt shop. “With the island’s tastiest pizzas, paninis, salads and fried chicken wings, it’s not your typical arcade food here,” she says. You know what else she told us? They deliver to the island, including Holiday Inn Resort Fort Walton Beach. ‘Hatchling Heaven’ is a 9-hole course designed for kids under 7, with cute and friendly baby dinosaurs waiting to greet tiny explorers. Up for more of a challenge? Join Professor Collins on a journey to Mount Chachimbiro, through 18 holes on ‘T-Rex Island,’ where sensors trigger animatronic dinosaurs with sound effects, fog machines and the works. Watch out: surprises lurk at every turn! On the ‘Tree Top Challenge’ ropes course, you can scale five increasingly difficult levels – challenging your balance, agility and skill. The view of the Gulf, Park and Bay from the top is reward enough. This exhilarating ride takes you up, down and all around a figure 8 track. It’s one-of-a-kind! You’ll flip for these trampolines, where you’ll feel like you can fly like a Pterosaur. Travel through the ‘jungle’ aboard your Jeep for a thrilling tour of the dinosaur reserve, where you’ll meet a giant Diplodocus and ferocious T-Rex. There’s also a high-speed chase through the Wild West. Bounce, tumble and explore this dino-themed inflatable zone. Navigate the lagoon with your remote control boat in a boat battle! There are more than 65 games inside, including Mach Storm, a first-person RPG flight simulator, Jurassic Park, Ski Ball, Pac Man and Sonic Air Hockey! There’s also a smaller game area for children 5 and under. You’ve never watched a film like this before – with unique motion and special effects immersing you in the on-screen action. Step over, crawl and twist your way through lasers while collecting raptor’s eggs to advance in rank. Wild Willy’s Adventure Zone is located at 1306 Miracle Strip Parkway SE in Fort Walton Beach. Learn more on the Wild Willy’s website or call (850) 400-3300.